I need to say "for me" because I'm starting to think I just might not like the original story. East of the Sun, West of the Moon, The Snow Queen, I don't know, there's something about all that trekking through cold, bleak tundras that turns me off. So maybe it's me. Or maybe it's the book. It's so incredibly long and not much happens at all. 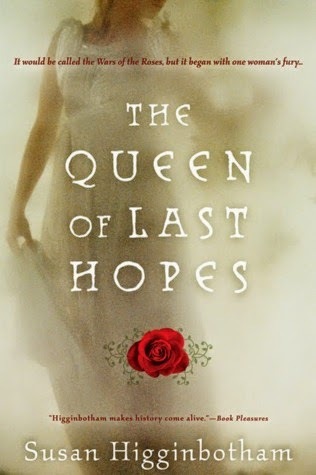 The characters are bland, the plot drags, the flashbacks fell short, the side plot did nothing for me, the romance was unemotional, and the villain wasn't that interesting. It's like everything was blanketed in muffling, dulling heaps of snow. There was just so much book here and so little substance. 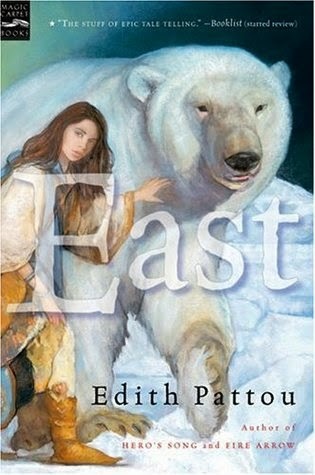 The chapters are super short though, so it was easy to speed through East despite the mammoth size. I think that's the only reason I didn't DNF. Snow White was never my favorite fairy tale either, but it's a princess story, so I'm always at least partially predisposed to liking it. And, overall, I did like this one. With some reservations. 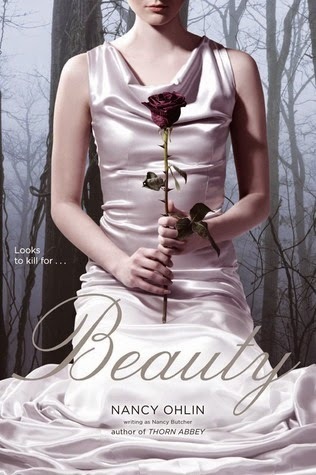 Nancy Ohlin's version was definitely unique, twisting the traditional focus on Snow White's beauty into a story about body image and disordered thinking. This was a much deeper, sadder story than I usually associate with the original tale. Nancy Ohlin did an excellent job exploring the relationship between the Snow White character and her mother and the disordered thinking and emotional pain between the two. These women are both damaged and ill and while it was very well done, it was also very uncomfortable to read. Which is my main problem with the book. I don't like issues books, and this is definitely an issues book. 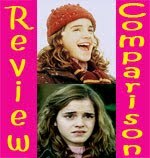 Sure it's fantasy and takes place in a fantasy world with magic and potions, but it's really an issues book. 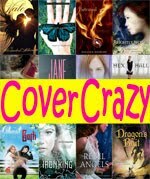 Check it out if you're looking for a short, unique fairy tale retelling like the Once Upon a Time series (particularly the The Rose Bride). Just be prepared for something much weightier and darker. How many Tudor books are there? Now how many are written from the perspective of Henry VIII? VIII is the only book I know of that takes this approach (though if there are others, please share!) and for that alone I'd say it's worth reading. At least for Tudor fans, because I'm really not sure it stands on its own for the non-Tudor fan. There's a lot of jumping around, and Henry VIII is not the most likable person so I wouldn't really recommend this to readers who aren't already invested in Henry's story. VIII follows Henry's life from early childhood through death, but significantly more emphasis is placed on his youth. Childhood through Catherine of Aragon takes up more than half the book, Anne Boleyn gets about a quarter, and the remaining four wives share the final quarter. See a problem? The pacing and plotting of VIII was inconsistent and uneven. This is further exacerbated by pages and pages spent on Henry's early years, primarily focused on jousting, gambling, and other sporting activities. Learning about Henry's interest in jousting is good. Having it repeated over and over without adding anything new to the narrative isn't very good. A lot of focus is also spent on Henry's visions. This was a nice way of showing Henry's belief in a god-ordained rule and his fears of deviltry (both which had a significant impact on his actions), but I think the author took things too far. I read too many pages about fictional hallucinations and not nearly enough about actual historical events. On the positive side, H. M. Castor does a nice job providing context and motivations for Henry's actions. The psychological and historical impact of the Wars of the Roses, the rule of his parents, and the death of his brother are all explored to explain his drive for sons and empire building. Henry's relationships with his mother was particularly well drawn, though I take issue with the way his relationship with Arthur and his father (oh what a one note villain!) was presented. I was hoping VIII would provide me with more of the "why" behind Henry's actions, and H. M. Castor does a pretty good job addressing this. That said, once you get beyond Henry's early years, you're almost better off watching Showtime's The Tudors. As for depictions of Henry's personality, the show does a better job at displaying the nuances of Henry's character. H. M. Castor's Henry was a little too one note and rarely showed the softer, caring, passionately loving side of Henry that made him such a mercurial terror. The most disappointing thing about VIII is how many major historical events are completely omitted or seriously glossed over. Wolsey goes from being alive and in favor, to dead. Ditto Cromwell. Thomas More is barely mentioned. Suddenly Henry is married to Katherine Howard, then all of a sudden she's dead. Important events like this are told briefly, often after the fact, and in an extremely flippant manner. As a first person narrative, this does help establish Henry's callous personality well, but, as I said, it removes all nuance and distorts his character. His agonizing over his decisions did not come through at all. 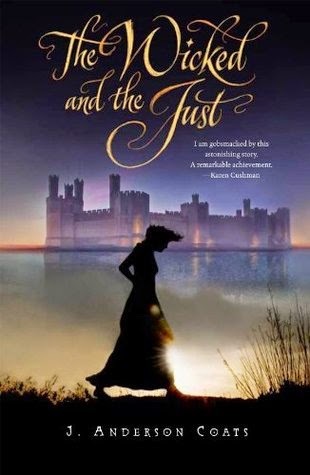 Worth the read for Tudor fans for the novelty factor of finally having a book told from Henry's point of view instead of one of his many wives. The chapters are super short (1-4 pages on average), so even though this is a big book (my copy clocked in at 415 pages), it's still a fast read. I think the best approach to VIII is to look at it as a part of a whole. 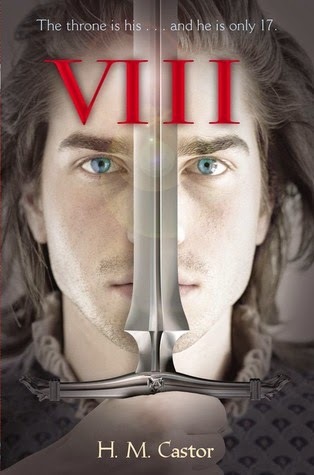 On its own, VIII stands poorly as a one stop shop exploration of Henry VIII. 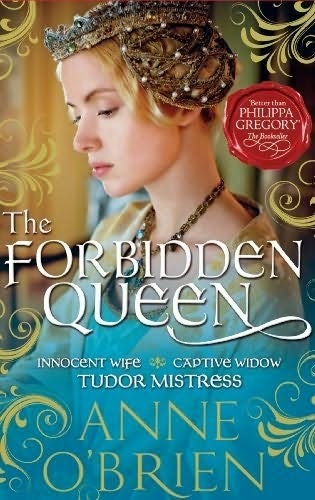 But, as another book among many to read to explore the Tudor era, it proves a nice addition. There's a lot of promise here, but I think a heavier hand on the part of the editor and a more nuanced approach to Henry's personality would have done wonders. I'm curious to see what H. M. Castor writes next, but I would check it out of the library first. Elizabeth of York is one of the blander players in the turbulent Wars of the Roses, but Margaret Campbell Barnes did a great job crafting an engaging story despite having limited material with which to work. I couldn't help but feel utterly disappointed by the cold relationship that never warmed between Henry VII and Elizabeth, but that is hardly MCB's fault (blame Henry VII). 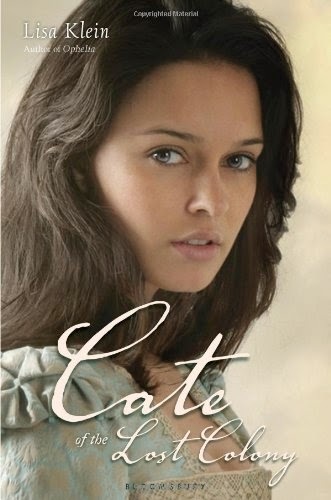 I know, I know, I'm always going on about historical accuracy and not liking liberties taken, but this book would have been fantastic if MCB had taken big liberties and written in a slow burn romance between Henry and Elizabeth. And then it would have been historically inaccurate and I would have complained. But complained. And I can't accept historical inaccuracies on such a grand scale, even if my romantic, traitorous heart wishes it so. So, instead I followed Elizabeth around in her awkwardly NOT first person narrative (third person was used, but it so felt like it should have been first person) as she lamented her loveless husband, her uncomfortable past (I liked how MCB handled the Richard III romance question), and her uncertainty over the fates of her brothers and the identity of the pretenders. While this isn't all battles and pomp, I absolutely loved it. Elizabeth came alive as a person, and her thoughts, hopes, dreams, and fears were so palpable. 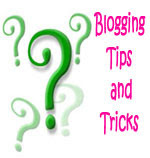 I especially liked how MCB approached the issue of the pretenders. Elizabeth's reactions and torn loyalties were spot on to how I would imagine them to be and described in a way that I ached for her. 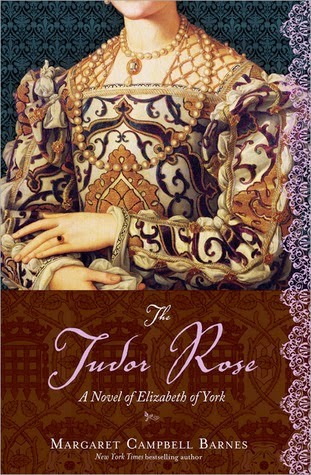 While this book is, at its heart, about Elizabeth, The Tudor Rose does a great job portraying Henry VII and the political tightrope he walked. So much Plantagenet/Tudor fiction focuses on the big battles and bold personalities, but not much attention is usually placed on this interim period (after the wars, but before the six wives). Which is a crying shame, because this time period is turbulent and tense and jam packed with political intrigue! Recommended to history fans. I am now on a quest to find more books by MCB, which is proving to be difficult since, outside of The Tudor Rose, none of my libraries carry her books. Oh well, I will prevail, because I am without a doubt reading more of her books. I always feel guilty rereading books, but I also really enjoy rereading my old favorites. Especially when I'm feeling vulnerable to scared or sad or disoriented (which are all feelings that go along with Big New Changes, even when they're good). So, I've been doing a little rereading this year. And I've been enjoying the heck out of it. So much so, that I almost don't even feel guilty for taking precious reading time away from new-to-me books. But! Adding books to lists makes me feel better. So I went out and found a challenge solely so I could add my guilt-tinged rereads to a totally guilt-absolving list of accomplishments. Yep, I'm feeling better already.